Remember when Apple coined the phrase, “There’s an app for that,” 10 years ago? Well in the compact equipment world, you could easily say there’s an attachment for that. While some people may never look beyond their traditional buckets or forks, there’s a plethora of innovative attachments for tool carriers like skid steers, track loaders and excavators these days (some can even be switched between them). The market is full of interesting options. Shotcrete? Micro-padding? There are loads of unique attachments offered by both big machine makers and third-party specialists. Have some cleanup to do? You’re in luck. John Deere’s new GS66B, GS72B, GS78B and GS84B scrap grapple buckets and its GR72B and GR84B rock grapple buckets are the perfect tools. John Deere says that the scrap grapple buckets are ideal for scrap handling, recycling center use, disaster cleanup and jobsite cleanup applications where grappling power is needed to handle material. The rock grapple buckets lend a hand in land clearing, jobsite cleanup and brush removal applications, as well as allow for grading the site after debris removal. Compatible with select John Deere G-Series skid steers and compact track loaders, L-Series compact wheel loaders and many competitive models, each unit includes two independent-action grapples that allow different-sized objects to be picked up in each grapple. The company says that a 24.4-in.-wide grapple arm and grapple stance width of 60.6 in. on the GS66 and GS72/GR72 and 65.3 in. on the GS78 and GS84/GR84 units allow for easier grappling of wide, difficult material. Bolt-on side plates are available for scrap applications where containing the material is necessary, and the scrap grapple models also feature convenient predrilled cutting edges for optional bolt-on, replaceable edges. Moving from grappling to earth works, Burly Attachments and Ozzie’s Pipeline Padder Inc. are tackling soil in unique ways. 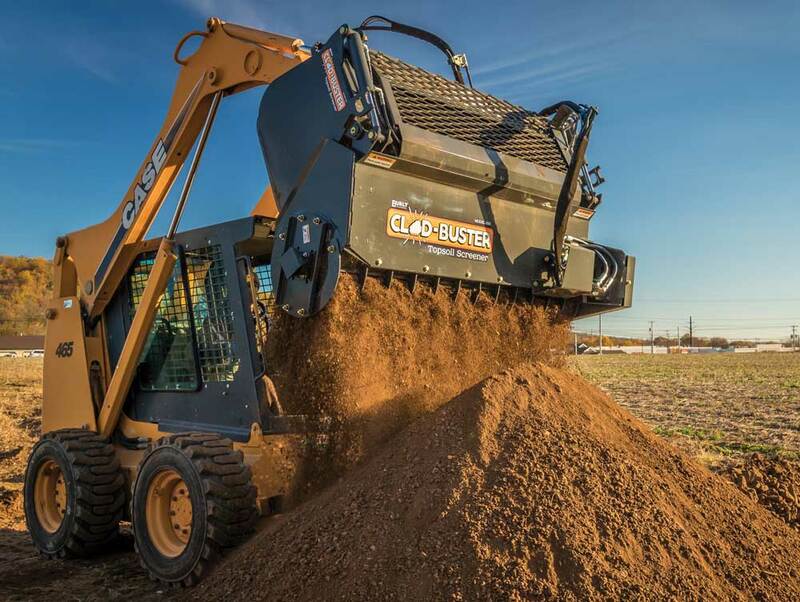 Burly’s Clod-Buster Topsoil Screener gives skid steer or compact track loader operators the ability to turn mountains of dirt into ready-to-grade topsoil. The screener boasts a Hardox steel agitator that shreds the clods so only the fines pass through. The company says this gives operators a consistent grade of topsoil wherever they need it. Ozzie’s micro-padder can screen native soil down and place it in a trench with one pass. The micro-padder can process up to 80 cu yds of material per hour, making it ideal for backfilling small diameter pipelines, cable for solar and/or wind farms as well as any other form of underground cable or conduit. Like all of Ozzie’s padders, the Micro-padder is a self-loading machine requiring a single operator and no additional support equipment. If you’re working in concrete or shotcrete applications, check out Blastcrete Equipment LLC’s RD6536 skid steer pump attachment. It offers operators a fast, efficient solution for pumping grout materials, 3/8-in. shotcrete and 3/4-in. structural concrete mixes. Compatible with any skid steer, the attachment features Blastcrete’s 3-in. hydraulic squeeze pump, making it ideal for ICF, block fill, form and pour, driveways, basements and shotcrete applications. Blastcrete Equipment says that the RD6536 offers variable speeds up to 25 cu yds per hour, and contractors can pump materials 250 ft horizontally and as high as 50 ft with the use of a rubber delivery line. The RD6536 can run in both forward and reverse to relieve pressure buildup and clogs, eliminating potential damage to the pump. The attachment’s receiving hopper includes a hydraulic agitator that keeps the mix well-blended, ensuring aggregate and sand stay evenly suspended throughout the mix. At World of Concrete in January, Bobcat released a new line of six nitrogen breaker attachments available for its mini excavators, compact track loaders, skid steers and mini track loaders. 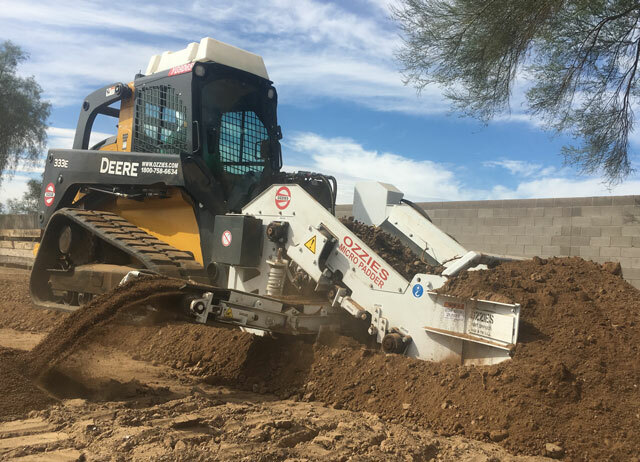 “The Bobcat nitrogen breaker has the impact power customers want for difficult demolition jobs, like removing reinforced concrete slabs,” says Travis Kidder, Bobcat attachment product specialist. According to Bobcat, the nitrogen breakers have minimal internal parts, a single lower bushing and easily accessible grease ports — reducing the breaker’s maintenance requirements and making rebuilds easier. The breakers boast a unique valve design which lessens hydraulic pressure fluctuation, as well as stress on the carrying equipment’s hydraulic pumps. A loader X-Change mounting frame on the breakers allows operators to easily swap the attachments from a compact loader to a compact excavator. Bobcat points out that it’s a popular feature for rental stores that rent breakers across a variety of compact equipment. Another World of Concrete debut includes Vacuworx’s next generation of its SL 2 Subcompact Vacuum Lifting System. The system was originally launched in 2016 and was the company’s first compact equipment attachment. Vacuworx says that the vacuum lifter has revolutionized the way saw cut concrete can be handled on jobsites, saving man hours, promoting safety and reducing debris. The new, updated lightweight system has an improved hydraulic system and modular pads — allowing it to work with more machines in even more applications. The company says that the SL 2 now features a base unit — available with manual or wireless remote control — with modular pad options. The pad options include a standard 24-in. by 24-in. pad, along with a 12-in. by 36-in. pad for handling more narrow trench cuts. Other sizes are also available upon request. 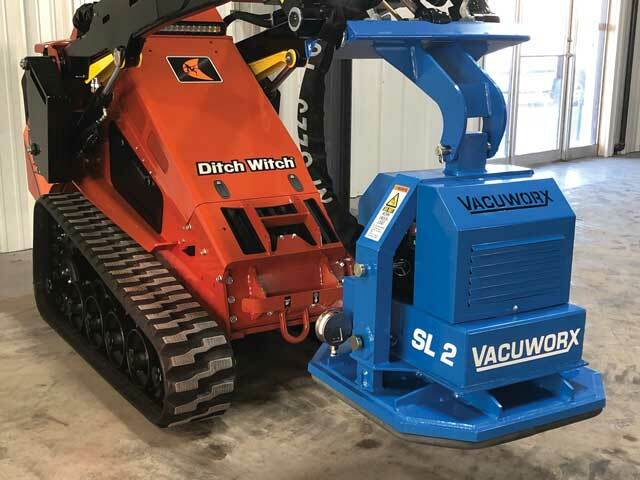 Although Vacuworx recommends outfitting the attachment on host equipment with a case drain, the company has engineered an innovative hydraulic design into the system to allow contractors to be able to use the SL 2 with the equipment they already have (such as mini excavators and older skid steer models). To round things out, I’m a personal fan of New Holland’s recently introduced large capacity farm grapples for skid steers and track loaders. Just look at that gnarly implement above. The grapples are available in 72- and 84-in. widths and help operators handle and transport large and loose materials like brush and round hay bales. They also feature a Teflon coated bushing which provides lubrication to all pivot locations, which just sounds cool. I’ll keep you updated on more cool attachments as the year goes on. Attachment makers, send info to pkleineke@benjaminmedia.com. The Gehl RS5-19 telescopic handler becomes more versatile with a Universal Skid Steer Attachment Adapter. 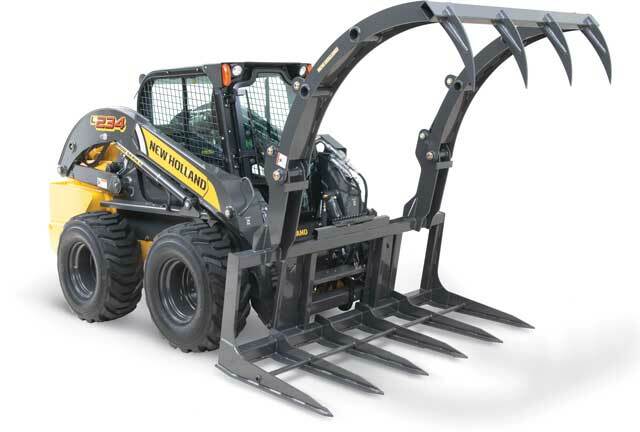 The Universal Skid Steer Attachment Adapter is commonly used with the 72-in. grapple bucket, 72-in. hopper broom or an auger from the Edge skid steer/track loader attachment line. 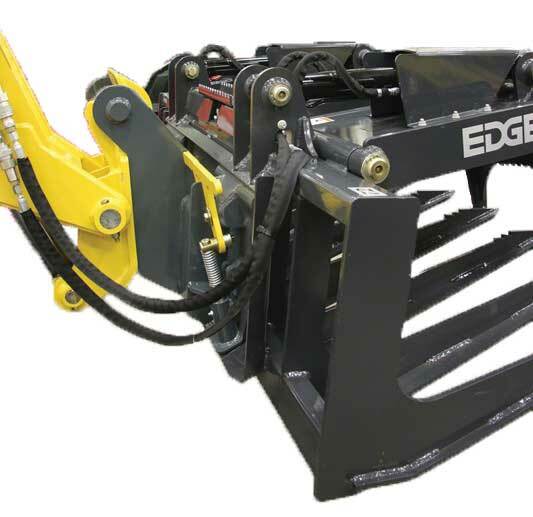 The company says that operators should take note that the Universal Skid Steer Attachment Adapter is not designed for use with skid steer attachments that require high and/or continuous auxiliary hydraulic flow or those that place excessive loads on the machine or couplers such as ground or pile engagement. The weight of the any skid steer attachment used with the adapter plate must also be below 1,000 lbs. For more info, visit edgeattach.com. 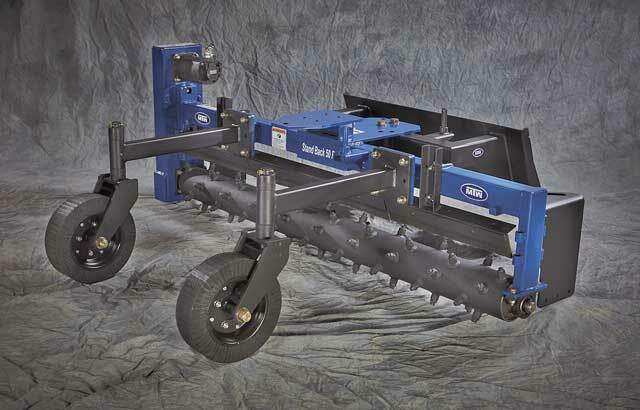 The MTW Power Box Rake from MTW Specialty Products is an ideal choice for breaking up, raking and leveling hard-packed soil, gravel, sod and other terrain. MTW’s Heavy-Duty Power Box Rakes can handle a diverse range of projects from developing and maintaining building sites and trails to final seedbed preparation. Three models are available for both hydraulic skid steers and PTO tractor applications and can be ordered with weld-on teeth, replaceable teeth or carbide teeth. All units come standard with airless solid rubber tires, and manual adjustments can be made to deflect material from 10 to 20 degrees. The Mark III is MTW’s most rugged model with a standard 8-in. diameter rotor and is available in 7-, 8- and 10-ft widths. It’s designed for high-flow skid steers and tractors exceeding 60 hp and features .375-in. wall construction, reinforced fabrication throughout, extreme-duty hitches, a virtually indestructible chain case and fabricated wheel yokes. There is also a Mark II and Mark I power box rake, but to learn about those, visit mtwpowerboxrakes.com. Check out more attachments here.